Without a doubt, one of the great railfan sites in Colorado would be the Moffat Tunnel. It's six mile length through the continental divide bypassed 27 miles of difficult railroad, some above timberline over Corona Pass , also called Rollins Pass. The tunnel was named for David Moffat, one of Colorado's great historic figures. The elevation at Moffat is just over 9,000 feet, so conditions are mountain-like, the same as much of Colorado. Prior to the tunnel's construction, trains had a 27 mile route over that 12000 foot pass. This is a picture of David Moffat, taken by historic photographer L. C McClure. Moffat was involved in an armed robbery in downtown Denver just prior to this picture being taken. His small Moffat Road station can still be seen just north of 15th Street and just west of the Post Office Terminal annex. 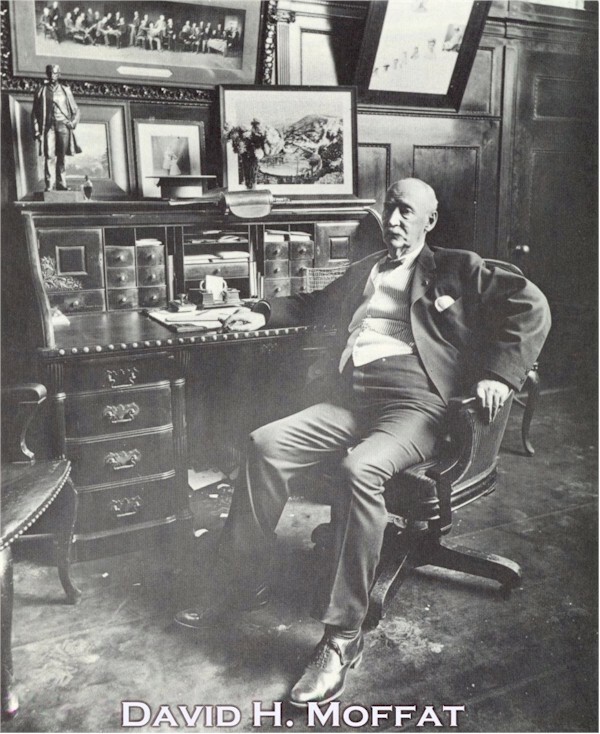 The big money roads forced him to use his own station in early years, rather than the large Union Station that now stands at 17th and Wynkoop in Denver. In later years, Moffat's trains were allowed to use Union Station, but continued to use the outside tracks, furthest away from the station. In the late 1930's, Moffat's Denver and Salt Lake railroad was merged into the Denver and Rio Grande Western when the Dotsero Cutoff was built, connecting Denver with Grand Junction, Salt Lake City and points west. In the picture above, on the wall a picture can be seen of Yankee Doodle Lake, a scenic loop on the Rollins Pass route. Fifty miles west of Denver we encounter the East Portal to the Moffat Tunnel - named after Colorado railroad pioneer David Moffat. The route the train has taken from Denver into the Front Range follows the right-of-way laid out by Moffat back in 1902 while he was seeking a better and shorter route to Salt Lake City. The buildings at the East Portal house the power plant and equipment used for ventilation. This 6.2 mile long bore through the Continental Divide is 9,239 feet above sea level at its apex. It is the 6th longest tunnel in the world. During its construction, 750,000 cubic yards of rock were removed using 2.5 million pounds of dynamite to shake it loose. 700 miles of blasting holds were drilled, requiring 800,000 pounds of drill steel and 1,500 drills a day to be sharpened. Eleven million board feet of timber were used to support the shifting earth (the tunnel is largely concrete-lined today). The tunnel took 48 months to bore - average daily progress being 21 feet. The tunnel cost $15,577,817 to build, an astounding $475 per linear foot. The occasional flashes of light that can be seen in the tunnel are telephone and safety stations. The first train passed through the tunnel in February 1928.